Original designs inspired by the “One Thousand and One Nights” (“Arabian Nights”) folk tales, printed in 1000 copies as promotion for Sheraton Hotels Middle East, Arab Express Travel and Al Mabani Construction Group active in the Middle East mainly in Saudi Arabia. The numerals are Arabic and the face cards are labelled in Arabic. King translates to "Malek," Queen to "Malekeh," and Jack to "Amir." The joker translates to "Joker." 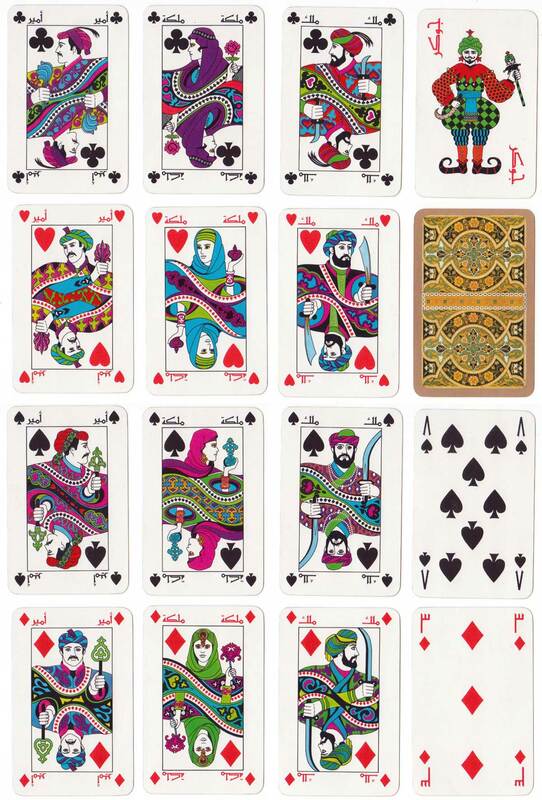 Above: Arabic playing cards designed by Evy Maros & Mourad Boutros, printed by Carta Mundi as a special limited edition with real Gold edges, c.1990.